Hey all! As I am sure some of the regular readers of The Flickcast have noticed, my favorite part of the Con season is taking pics at them. Unfortunately, due to some professional responsibilities, I was only able to get down to one day of WonderCon this year. But because my time was limited, I didn’t waste it on panels and the like. Instead I hit the floor with camera in hand and got as many pics of the Wondercon sights as I could. While WonderCon doesn’t have the size of San Diego or New York Comic Con, the fans there weren’t any less fervent with their cosplay love. This year I saw a lot of new and original costumes I had not seen before. While a pimped out Boba Fett was present, I also saw for the first time Paper Mario as well as a group of female X-Man villains. Alongside the working R2 units, there was a life sized Wall-E that sadly the picture doesn’t do justice as it captured all of the personality of the movie and brought it to life in front of us all. It’s the news Whovians everywhere have been waiting for. 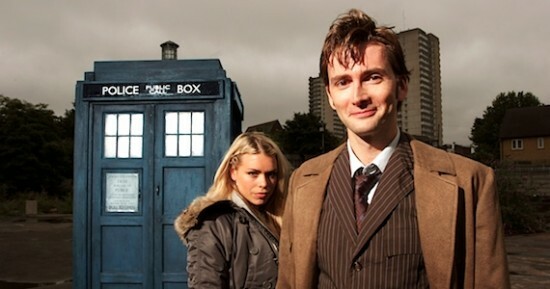 The Tenth Doctor (David Tennant) and Rose (Billie Piper) will be return to Doctor Who for the 50th Anniversary. John Hurt is also slated to appear alongside current the Doctor (Matt Smith) and his companion Clara (Jenna-Louise Coleman). This news comes as a surprise, though a very welcome one, to Doctor Who fans. As we reported only a few days ago, Steven Moffat himself was not confirming any details and just a week ago John Barrowman (Captain Jack Harkness) confirmed he wouldn’t be involved in the anniversary. Tennant was last seen as the much beloved Tenth Doctor in 2010’s The End of Time, which was also the last time we saw Piper’s Rose. There’s new life and new guest stars ahead for season three of TNT’s Falling Skies. Robert Sean Leonard and Gloria Reuben are both set to appear in the hit aliens vs. human drama, which returns for 13 episodes this summer. The latest season kicks off seven months after the end of season two with Anne (Moon Bloodgood) giving birth to her and Tom’s (Noah Wyle) first child. The birth of the baby may single a calmer time for the 2nd Mass. As Seychelle Gabriel, who plays Lourdes, said, “The darkest moments are behind us.” That doesn’t mean fans won’t be seeing any more fights between our heroes at 2nd Mass and the mechs and Skitters. As the premiere of the highly anticipated Man of Steel feature film with Henry Cavill draws closer every month (it’s set for June 2013), fans of Clark Kent and his alter ego can get geared up with Superman: Unbound. 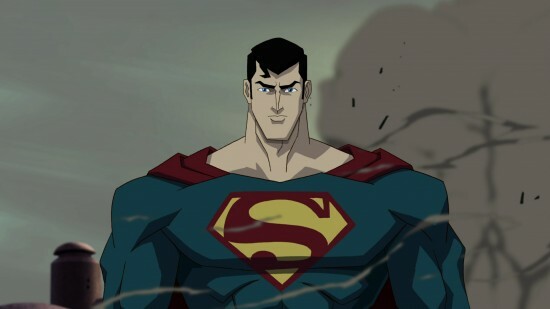 Coming out on DVD, for download and On Demand May 7, the DC animated feature pits Superman (Matt Bomer) against the formidable Brainiac (John Noble). Based on the Geoff Johns and Gary Frank’s Superman: Brainiac (2008), Unbound is an adventure that will please adults and kids, though it’s PG -13 rating is well earned thanks to the abundance of blood and guts, both human and alien. Bomer brings a steely quality to the Last Son of Krypton. Joseph Gordon-Levitt is fast becoming one of the most exciting actors of his generation. He generally makes smart choices, and even in the cash-grab roles, like Cobra Commander in the last GI Joe film, he brings a watchable angle to his character. So when word got out that he was re-teaming with Rian Johnson for a hard boiled Sci-Fi tale about time travel and hit men, it piqued our interest. Then we found out that he was playing a young Bruce Willis, all of our hearts went aflutter. So consider The Flickcast at maximum anticipation levels in the wake of these first images of Gordon-Levitt in subtle make-up to look like an young Willis. Word from early screenings and script reviews is that the movie might be stellar, and these early shots do nothing to change that idea. The first trailer premiered last weekend at Wondercon, so expect it to hit the internet soon enough. Not terribly noticeable from these two shots is that the bulk of the subtle make-up was applied to give Gordon-Levitt a young Willis silhouette. This means the he isn’t meant to look exactly like Willis, as he doesn’t, but to give the impressions that he one day ‘could’ be Willis. Check out the full new pictures after the jump. Who knew Thundercats would still be such a hot topic nearly 20 years later? A while back, we brought you some interesting “test footage” of Warner Bros.’ alleged lost CGI film with our favorite feline warriors. Now we’re getting the first footage of Cartoon Network’s upcoming revamped series. Don’t expect much of a change from the original, except for some great new animation and voice talent. Even some old friends are returning, such as the original Lion-O, Larry Kenney, who is coming along now to voice Claudus. From the official release. Based upon the iconic 1980s action classic, ThunderCats tells the epic tale of Lion-O and his battle against evil in the quest for the fabled Stones of Power. The series is executive produced by Sam Register (Teen Titans, Ben 10, Batman: The Brave and the Bold). Over the weekend at San Francisco’s WonderCon, Cartoon Network held a very special panel for the upcoming series and showed fans the first footage EVER. And for those who couldn’t make the show, we’ve got it here for you. Check out the new Thundercats footage after the jump. Ho! While San Diego Comic-Con still reigns supreme, one of the other big shows on the wast coast every year is San Francisco’s WonderCon. Much like SDCC, this show is for comic fans and movie fans alike, and some studios bring some great footage to share for their upcoming projects. Luckily, Warner Bros. brought along a whopping four minutes of their upcoming Green Lantern flick, and we’re finally getting a chance to see the tone and some great moments in the movie. That first trailer felt a little to Iron Man-y for many, so this one will definitely help you decide if you’re going to the midnight screening or not. In the footage, we get plenty of Oa, lots of Mark Strong as Sinestro, and we finally nail down exactly how they squeeze Parallax and Peter Sarsgaard’s Hector Hammond into the movie as two separate villains. For those editing buffs out there, they even managed to sneak a Yourahh! scream into all the chaos. Take a look at the footage after the jump and catch Martin Campbell’s Green Lantern in theaters on June 17th. During the Prince of Persia: The Sands of Time press conference at WonderCon this weekend, it was evident that all major players delighted in each other’s company and thoroughly enjoyed bringing the swashbuckling action adventure to life (especially Jake Gyllenhaal, who appears to have developed a fondness for stuntwork). During the course of the interviews, Jerry Bruckheimer (Producer), Mike Newell (Director), Jordan Mechner (Writer / Creator, POP Franchise) and Jake Gyllenhaal (Prince Dastan) all talked about the challenges and joys of bringing the popular gaming franchise to the big screen, and whether or not Prince of Persia will become a franchise. In preparation for his role as Prince Dastan, Gyllanhaal revealed that he stepped outside his “normal” process for getting into character. “I’ve never done research playing video games. I’ve never played video games as research before. Sometimes I’ve read books, or I’ve hung out with Marines, but you know, playing video games is great fun.” Gyllanhaal also related that he has been a fan of the game since it was first released in 1989, when sidescrolling play was a prominent feature. Although the gaming franchise provided a jumping off point (literally) for the live-action flick, Newell was quick to point out that they weren’t interested in retelling and rehashing what has already been visualized in the game, or elsewhere in movie lore.